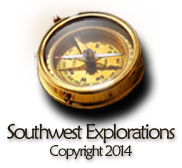 The survey of the western end of the U.S.- Mexico International Boundary began near San Diego. 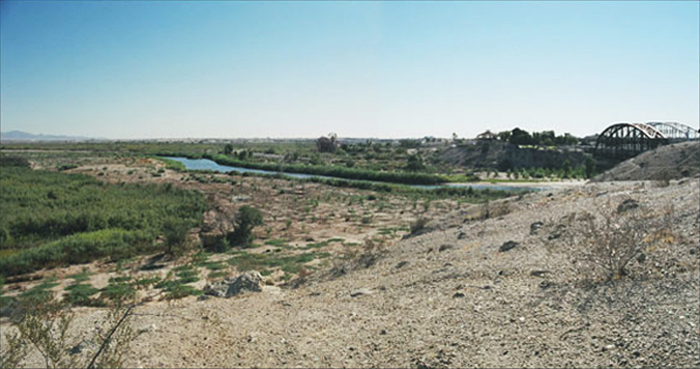 The first leg of the survey determined the exact position of the boundary at the Pacific Ocean and its position at the Colorado River and then drew a straight line between them (to read about this part of the survey, see the Journal Of San Diego History 1973 article titled “Amiel Weeks Whipple and the Boundary Survey in Southern California” by Thomas Scharf). After surveying the California segment, they crossed into what would later become Arizona and continued the survey up the Gila River, which was the agreed-upon boundary in Arizona until the Gadsden Purchase of 1854. 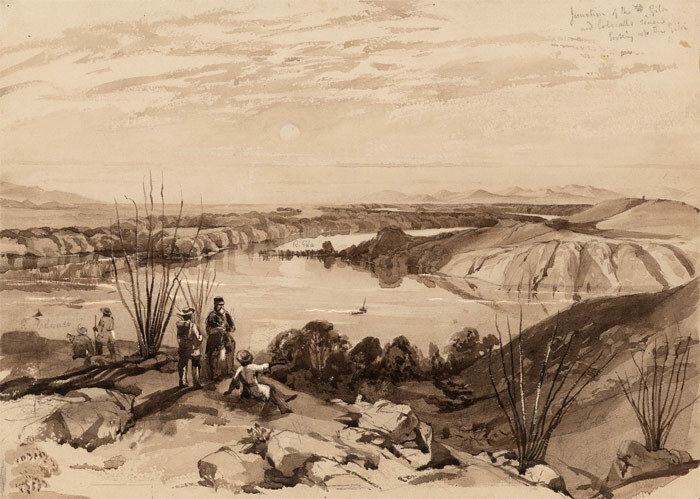 Pencil and sepia sketch by John Bartlett showing the confluence of the Gila and Colorado Rivers. John Carter Brown Library. This is the same view, made from the hill where Fort Yuma was located. The Yuma Territorial Prison is visible on the hill on the other side of the Colorado. The water visible in the picture is the Colorado River. The Gila entered it at this point in Bartlett’s day but now it enters several miles east of here. Tom Jonas photo 2005.